Now when Dawn in robe of saffron was hasting from the streams of Oceanus, to bring light to mortals and immortals, Thetis reached the ships with the armour that the god had given her. She found her son fallen about the body of Patroclus and weeping bitterly. Many also of his followers were weeping round him, but when the goddess came among them she clasped his hand in her own, saying, "My son, grieve as we may we must let this man lie, for it is by heaven's will that he has fallen; now, therefore, accept from Vulcan this rich and goodly armour, which no man has ever yet borne upon his shoulders." As she spoke she set the armour before Achilles, and it rang out bravely as she did so. The Myrmidons were struck with awe, and none dared look full at it, for they were afraid; but Achilles was roused to still greater fury, and his eyes gleamed with a fierce light, for he was glad when he handled the splendid present which the god had made him. Then, as soon as he had satisfied himself with looking at it, he said to his mother, "Mother, the god has given me armour, meet handiwork for an immortal and such as no living could have fashioned; I will now arm, but I much fear that flies will settle upon the son of Menoetius and breed worms about his wounds, so that his body, now he is dead, will be disfigured and the flesh will rot." Silver-footed Thetis answered, "My son, be not disquieted about this matter. I will find means to protect him from the swarms of noisome flies that prey on the bodies of men who have been killed in battle. He may lie for a whole year, and his flesh shall still be as sound as ever, or even sounder. Call, therefore, the Achaean heroes in assembly; unsay your anger against Agamemnon; arm at once, and fight with might and main. ", Homer The Iliad, book 19. Iσμαρικός· πίνω δ' ἐν δορὶ κεκλιμένος. 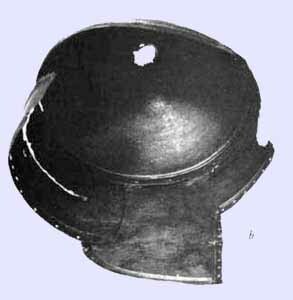 The defensive armour most used consisted of four pieces: helmet (kranos), cuirass (thorax), shield (aspis) and greaves (knimis). 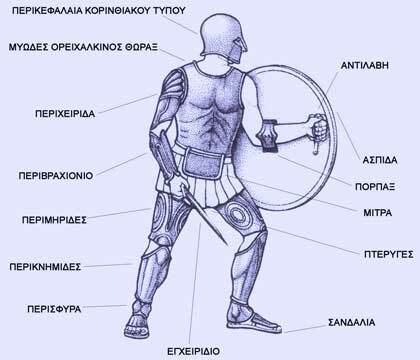 A weapon is called hoplon from which panoply and hoplite (a man with weapons) is derived (initially the shield was called hoplon (όπλον) but today hoplon is a general name for weapon). It was kept holding the antilabe in the border of the shield. 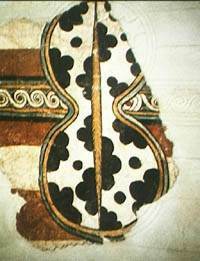 The offensive armour consisted of two spears (dori or dory) and a sword (xyfos). 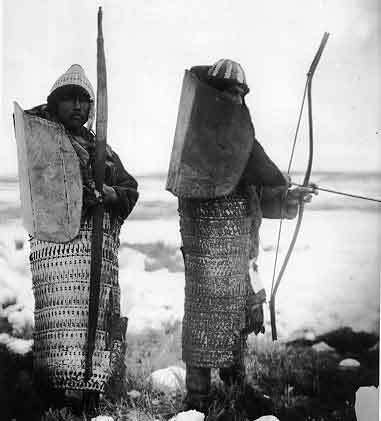 These six pieces of armour are estimated to have weighted about 35 kg. 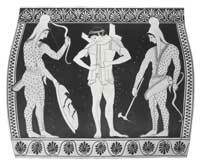 The hoplite carried them all, however, only in action. (WM). 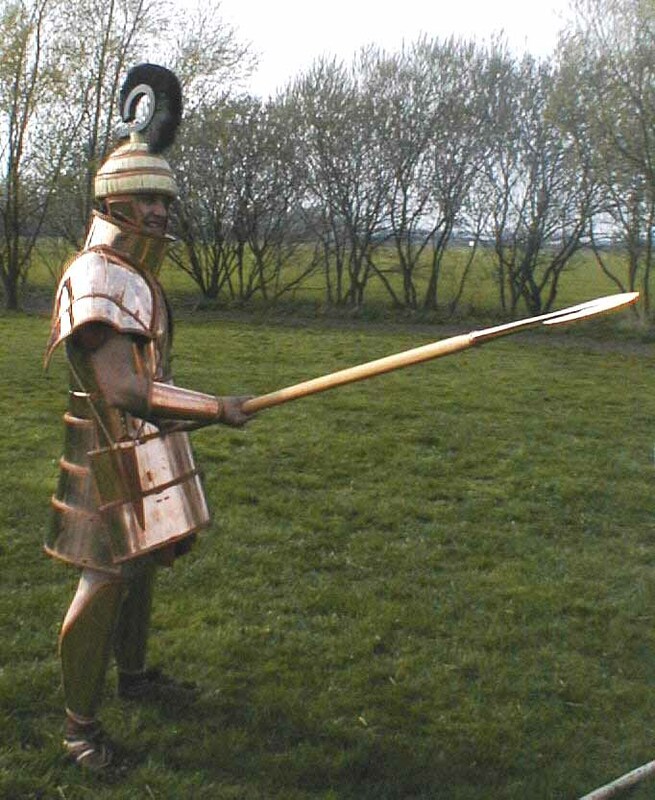 The macedonian army used a special long version of spear, the so-called sarissa (pl. sarissai) with a smaller head. Achilles wearing a so-called composite cuirass, image from a 460-450 BC red figure amphora (the artist is the so-called Achilles Painter), Vatican Museum. 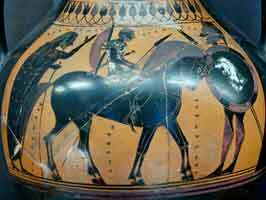 Why does Achilles needs a cuirass or any protection armor? Is his body not completely protected after a bath in the Styx river? 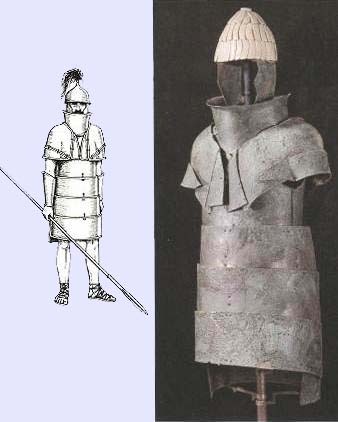 Now this armour saved his son's flesh from destruction. a bright fresh purple, fell down onto the dusty ground. 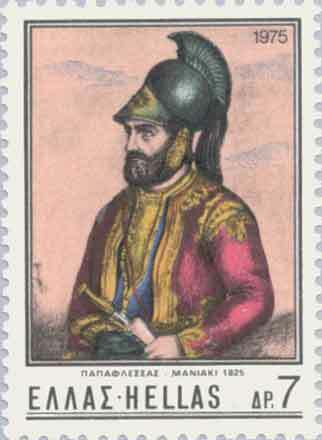 warlike Menelaus came to his assistance. 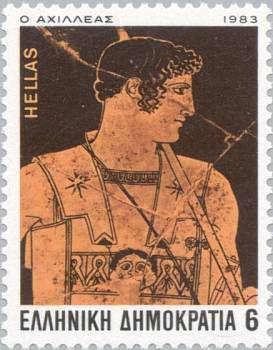 Menelaus speared his shoulder from behind. The eager spear kept going, driving into Dolops' chest. 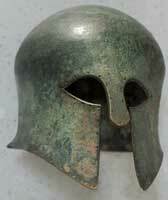 The Corinthian helmet (κόρυς κορινθίη) developed in the 8th century BC. Made from a single piece of bronze adapted individually for each warriors. 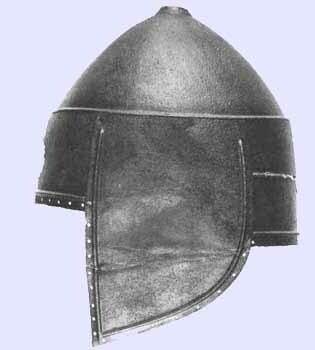 A problem is that it provided bad vision and it was difficult to hear with this helmet. 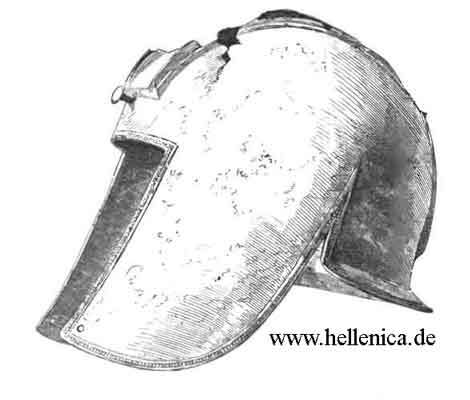 It was the most used type of helmets by the Greeks. The Ausean maidens keep year by year a feast in honour of Minerva, whereat their custom is to draw up in two bodies, and fight with stones and clubs. They say that these are rites which have come down to them from their fathers, and that they honour with them their native goddess, who is the same as the Minerva (Athene) of the Grecians. If any of the maidens die of the wounds they receive, the Auseans declare that such are false maidens. Before the fight is suffered to begin, they have another ceremony. 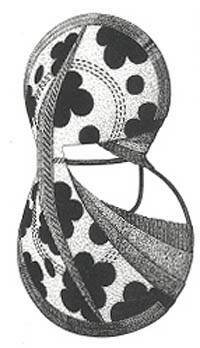 One of the virgins, the loveliest of the number, is selected from the rest; a Corinthian helmet and a complete suit of Greek armour are publicly put upon her; and, thus adorned, she is made to mount into a chariot, and led around the whole lake in a procession. Herodotus, Histories Book 4. 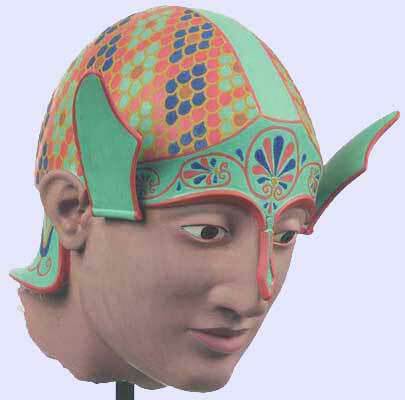 Often images and sculptures of various persons wearing this helmet pushed back on the head. 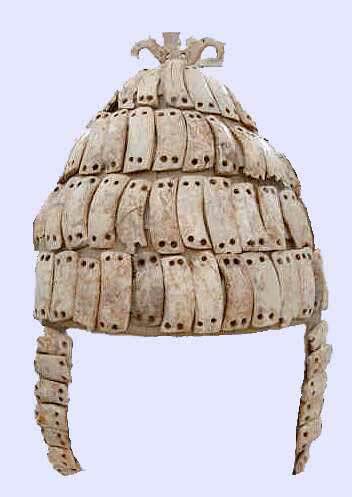 Replaced by other types more open-faced after the 5th century BC. 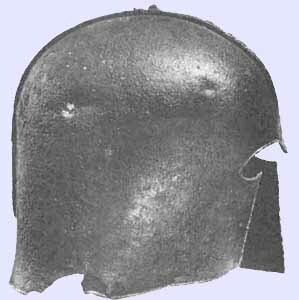 700 BC Kegel Helmet b) Helmet interior. 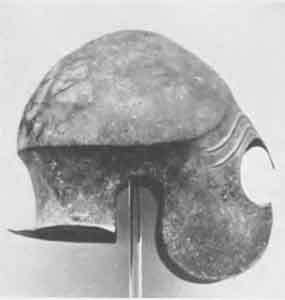 This helmet was made of several bronze pieces. 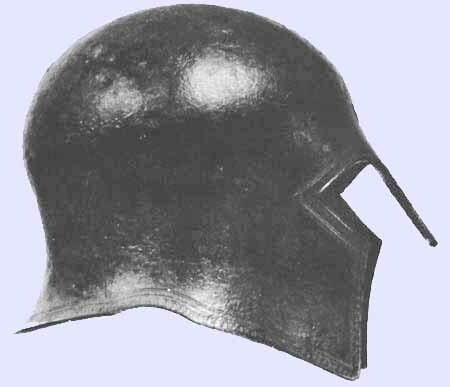 Chalcidian helmet. Bronze. Greek, 2nd half of the 6th century BC. 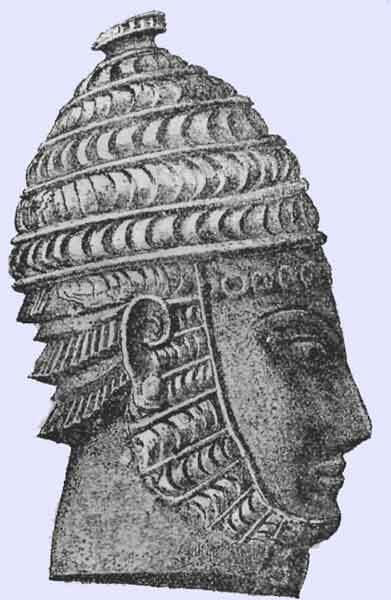 A Scythian helmet (seen in Greek sculptures or paintings, image above probably Paris from Troy. In the background left the sculpture of Paris today with other figures showing the second Trojan war with Athena as a central figure watching. 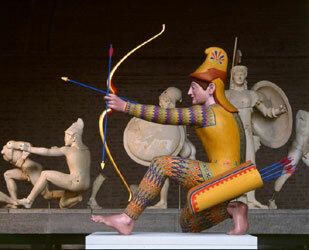 Scythian archers worked as mercenaries for Greek armies. 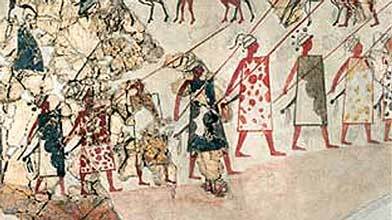 At the battle of Salamis the Greeks hired 300 Scythian mercenaries. 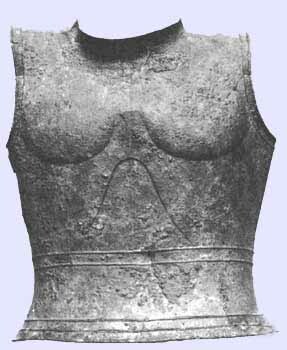 Usually 1/3 of the Scythians archers were women so that it is possible that not only men were fighting in Salamis but also around 100 women. Also the Persian army had women. Artemisia I, ruler of Halicarnassus and Cos worked for the Persian King Xerxes and during the Salamis naval battle she was a commander of a few ships. 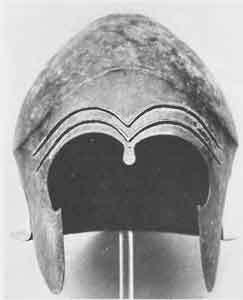 Illyrian helmet. Bronze. 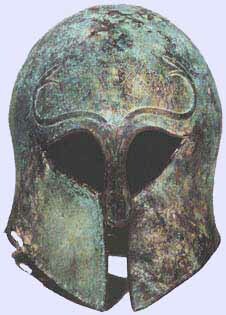 Greek, 6th-5th century BC. From Argolis. 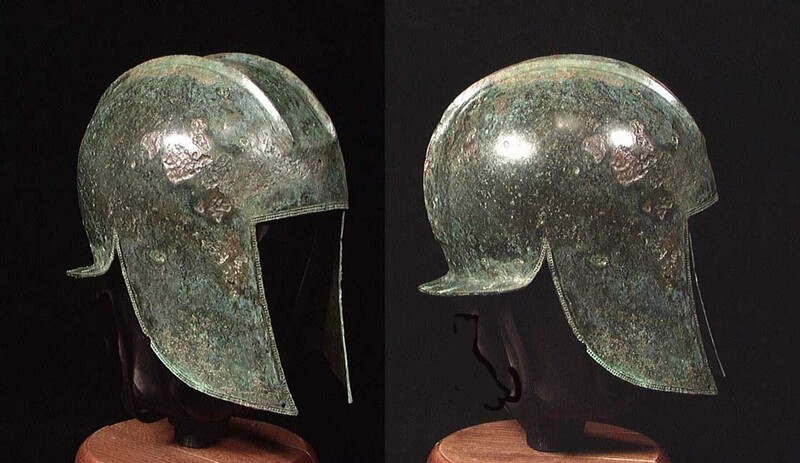 A Macedonian helmet ( a phrygian version) (Ioannina Museum, Greece), usually for the infantry with a blue color, 4th century BC found in Vitsa Epirus, see Macedonian helmet (from which this image is taken) and the image of an Iron Macedonian helmet from the tomb of Philip. 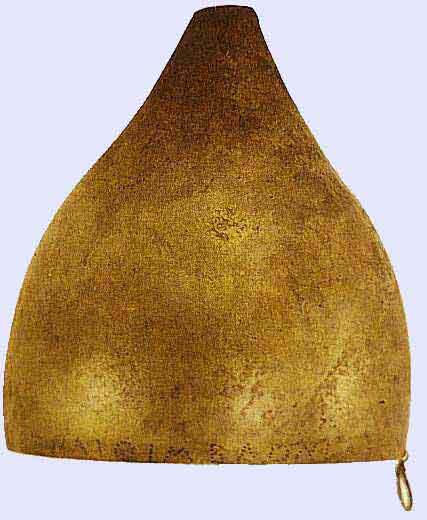 14th and 15th centuries Venetian Helmets from Chalkida. 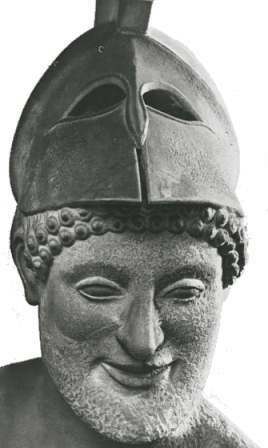 Youth with greaves holding a corinthian helmet.